Ojai has also been frequently called Shangri-La due to the spiritual energy that seems to imbue the valley and the surrounding beauty of nature all around. Since moving here I have seen deer, bobcats, foxes, eagles, hawks, and even just one week before writing this I encountered a bear on a drive back towards one of my favorite places of all – Meditation Mount. Even though it is surprisingly close to big cities (Los Angeles is just over an hour away), Ojai seems almost remote. Nature abounds. On the north side of Ojai is Los Padres National Forest that is one of the largest national forests in the United States. Hiking trails abound in this area and Hwy 33 is known as one of the countries most beautiful motorcycle rides. To the west is Lake Casitas, a beautiful large lake that can be enjoyed by residents. 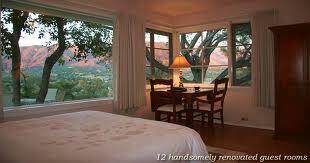 To the east is the Upper Ojai Valley where ranch land abounds along with a number of spiritual retreat centers. Speaking of spiritual retreat centers there are an abundance of them. My favorite place to stay is the Ojai Retreat.. Then there is my favorite spiritual center here to visit, Meditation Mount. Other places include the Krishnamurti Foundation, Krotona, the Ojai Foundation, Meher Mount, Camp Rama, and Casa de la Luna. If you retreat with me I am happy to include a tour of some of these spiritual centers in my retreat with you. In fact there are so many quiet peaceful places to retreat in Ojai when you go to Wikipedia to read about the town it is even noted that spiritual retreats is a part of the industry here. Want to go on a retreat with me here? Feel free to call 805-233-4291 Or, use the contact form below to reach me.